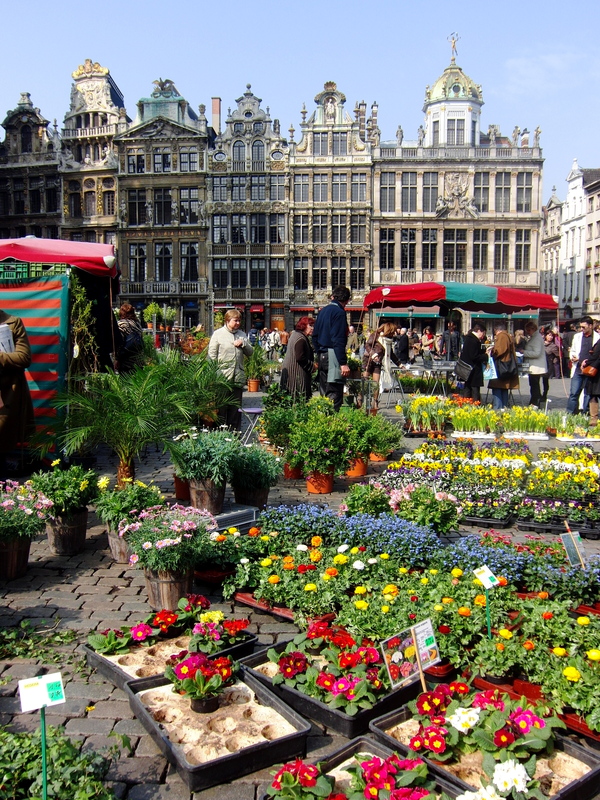 Above: The flower market at the Grand Place… a combustion of color against the Guild Houses of the Grand Place. Of course this display pales in comparison to the annual flower carpet, held every August on these ancient, tilted cobblestones. While visiting Brussels to stop by the various offices and headquarters of the European Union, I did my fair share of eating- of all categories. 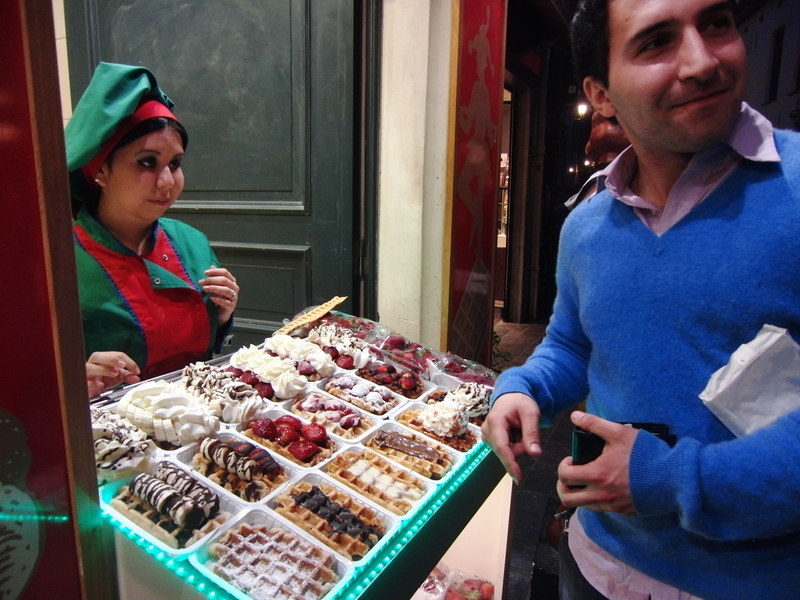 From fish to cookies to chocolate to ice cream… oh my… my taste buds were on an international frenzy all weekend. Brussels being nearly as international as New York, it is certainly a city that encompasses all corners of the food compass. After a recommendation by my fellow travel-loving cousins, I made a reservation for ten at Scheltema. As the person in charge of picking the restaurant for our group, I felt a healthy amount of pressure in choosing the right one that was sure to please all. Scheltema was a stellar pick, and my group was thanking me all the way home. 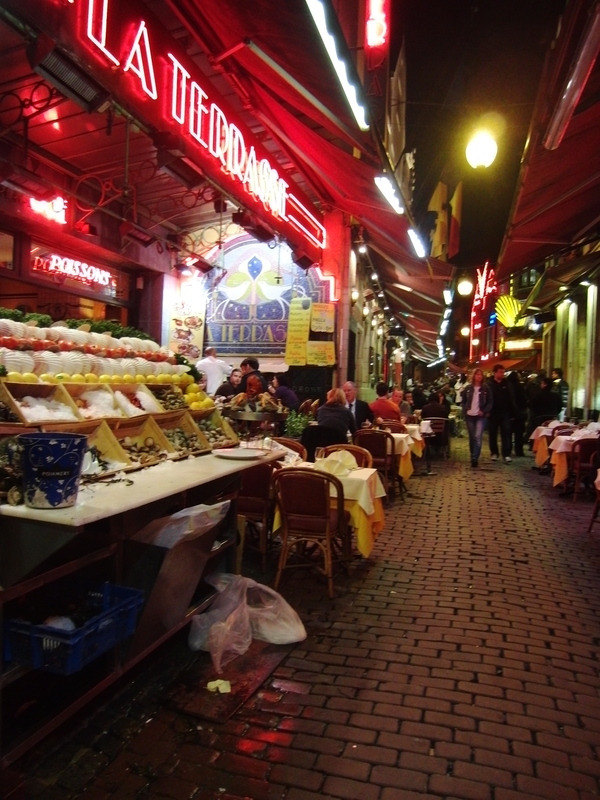 Tucked away in an alley off of the alley where many of Brussel’s most touristy restaurants are situated, Scheltema is a large, busy restaurant. We sat outside and were greeted by an older, somewhat stuffy waiter who was not too keen on serving a group of young Americans. We quickly won him over with our fine table manners and eagerness to try local foods. We asked his opinions on everything, and he basically ordered for each of us. I was awarded with the most perfectly cooked whole sea bass served with mouthwatering brussel sprouts and other none-too-greasy vegetables. 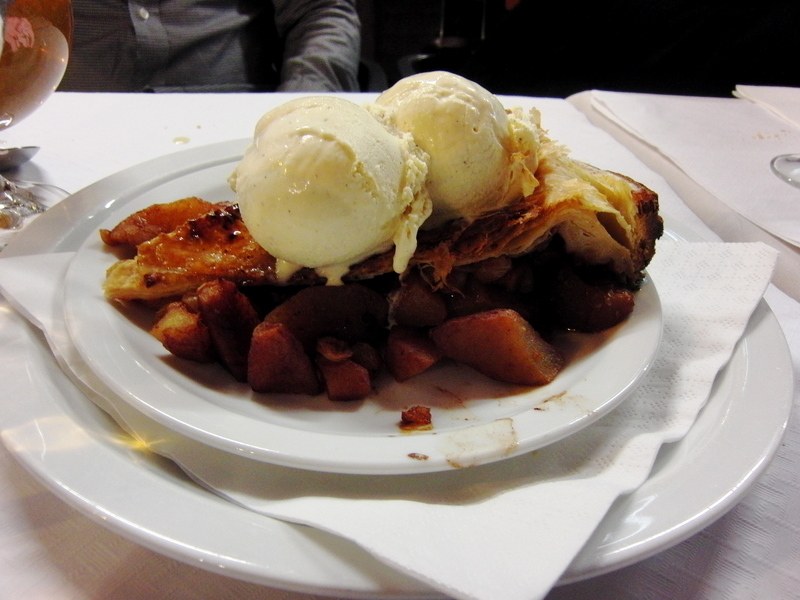 As the grand finale, our classy waiter, now far more jolly, brought out giant plates of warm apple pie and enormous gollops of homemade vanilla ice cream, as well as strawberry cream puffs and whatever other fattening desserts were left in the kitchen. 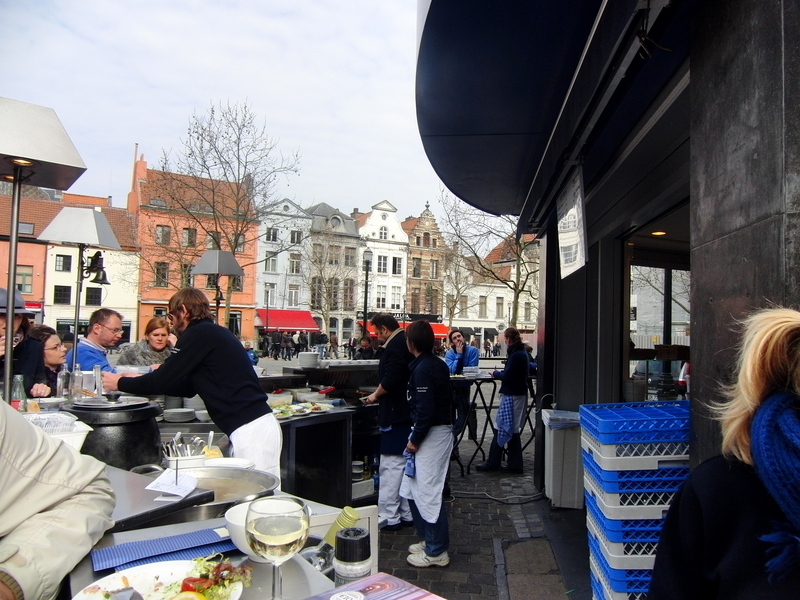 Another highly memorable dining experience in Brussels was at the very popular and trendy outdoor fish bar. Patrons picked out what fish they were craving, and the grill masters grilled the fresh catch to perfection right there on the outdoor grill in front of you. On a Saturday afternoon, this place is crowded enough to feel like a good time but not so much to feel overwhelming. It is clearly a spot for those in the know, and perhaps those with a few more euros to spend as it is quite pricey but certainly worth it. Everyone is enjoying a nice glass of wine and socializing. It has a very cool vibe. 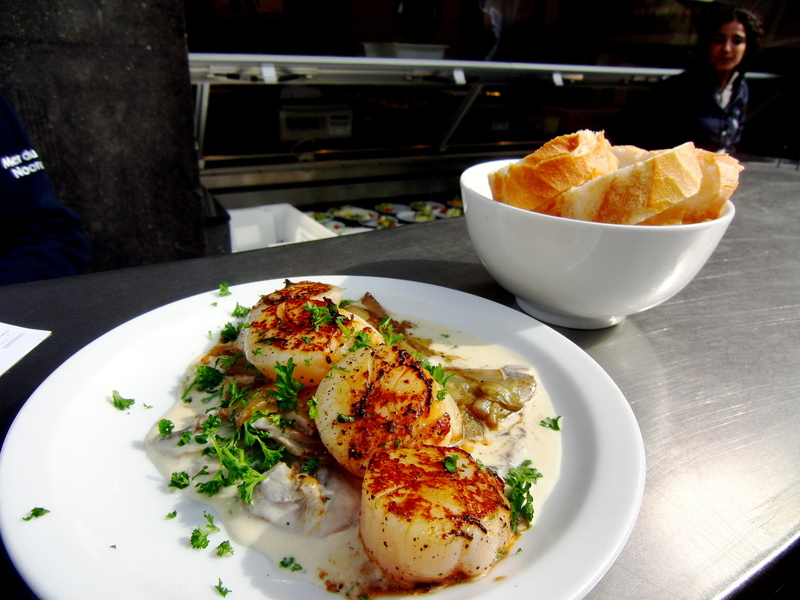 I had three of the best bay scallops of my existence standing at this bar, and with nothing else on the small plate but my three grilled scallops, I am still mystified as to how they were so flavorful and perfectly plump and firm.